With the recent Orlando tragedy that unfortunately claimed around 50 innocent lives caused by a mass shooting in a gay bar, many have come forward to show their support during these troubling times. This includes a lot of major corporations who want to let the LGBT community know that they are not alone and the most recent one to join the list is Honda. 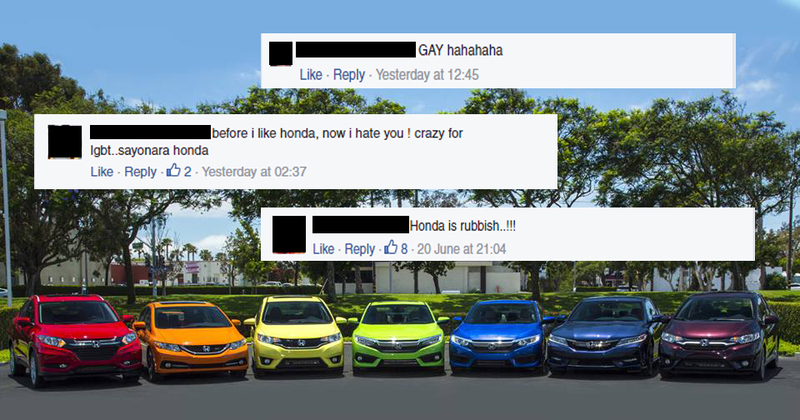 On June 18, the North American subsidiary of Honda Motor Company, Ltd, posted a photo on their Facebook page showing some of their vehicles lined up coated by the colours of the rainbow—a well-known portrayal of the LGBT movement. This was done in honour of them announcing their participation for the 2016 Columbus Pride Parade happening in Ohio. Malaysians caught wind of this and headed on over to the page where some serious homophobic comments were left. Multiple local users expressed their desire to boycott the brand and declared their plans to change their vehicles over to other motor companies as they refuse to support a company which shows allegiance towards the sexual minority. With this particular comment left by a Malaysian raking up to over 600 likes and being the first comment seen when viewing the photo, it’s quite clear on how many share the same sentiments with this being further proven by the string of comments with similar tones left after. Although the caption of this photo clearly depicted how it was curated for an LGBT parade in a country where gay marriage is legalised, it seems as though some Malaysians found the need to show off their homophobic stances on a platform where not only Muslims could see, but other people from different religions and beliefs as well who may not share the same sentiments. But it is not all bad. Despite there being some comments venting out their dislike on Honda’s stance, there have been a few individuals commending the brand on a good show of faith as well as expressing their sorrow that our country still has this lack of progression within the community. There were also a few who neither truly showed their support nor protest but mentioned how it seemed out of bounds for Malaysians to leave such comments on something that was clearly geared towards the American community. With there being such mixed responses from our country, it’s a little difficult to summarise what exactly is Malaysia’s stance on the LGBT community. While there are those who adamantly refuse to accept this movement, there are also a number of individuals who are following the stream of acceptance as the rest of the world and opening their mind towards progression. Homophobia is unfortunately still running around rampant and forces the mind to reject any healthy debate on what is believed to be acceptable. A country’s growth depends on its citizens so with backward thinking such as this, is it plausible to believe Malaysia will ever be at the same level as the rest of the world? What are your thoughts on this campaign done by Honda? Do you support it or not?